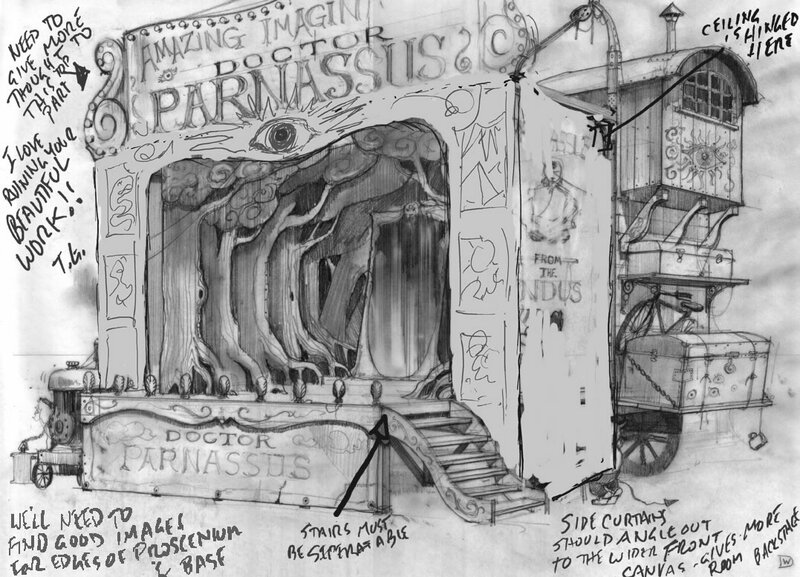 In December 2009, Dave Warren spoke to Dreams about the design of The Imaginarium of Dr Parnassus. 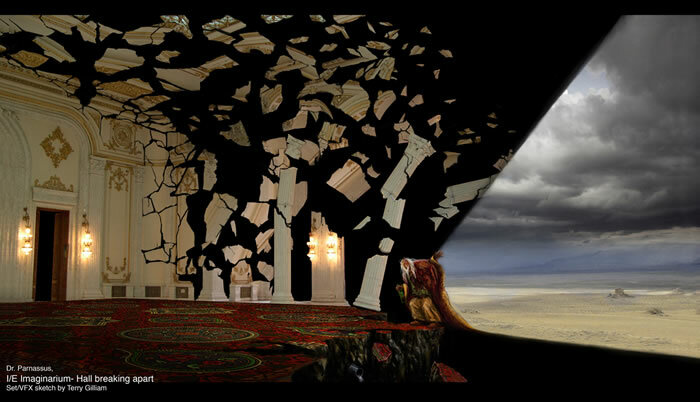 An experienced Art Director, his credit on this picture is "Original Design and Art Direction", which he shares with the film's director, Terry Gilliam. 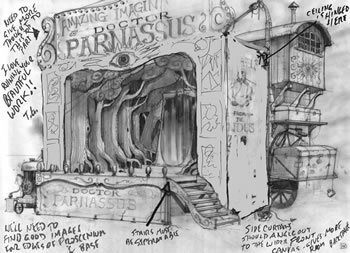 In this interview, Dave explains his experience of working on Dr Parnassus, and in particular the design obstacles that needed to be overcome - to bring this picture from conception to completion. Phil Stubbs: How did you get involved with the project? Dave Warren: Actually, I've known Terry on and off since 1992. I did a thesis in college about Terry and I interviewed him towards the end of it. In a funny kind of way, it's almost like he's sown the seeds of a career to reap fifteen or twenty years later. It's not quite as cut and dried as that, but I sense there's something like this going on. After that interview he asked: what do you do? I said I was trying to be an illustrator. He said: you must come in with your work, I'd love to see what you do. I thought: Terry Gilliam is clearly a man with time on his hands! At that stage he'd probably just done The Fisher King and that was going to open. I did meet him, I went up to Highgate, I did the whole show-and-tell thing. Then I had this phone call out of the blue while he was working on The Defective Detective. He was with Paramount trying to get it off the ground for $25m. He said he could do it for that, and they said he couldn't. He got a little development budget together. At this point Dante Ferretti was in the UK, probably for early meetings for Interview with the Vampire. Dante Ferretti is an old mucker of Terry's, having done Baron Munchausen. So Dante came for six to eight weeks with Terry on production sketches for The Defective Detective, which I still have photographs of somewhere (so remind me of that one day). I got a phone call from Terry (or Maggie) asking if I could come and help Dante put this model together of the big cityscape of The Defective Detective. I did that for a month. Then the film went off to land of development, which is beyond the rings of Saturn, never to come back. Dante went on to do Interview with a Vampire, and he told me: if you're not working then you can come with me. So I was set on the horrendous steel rails of the film industry, never to get off. And I've never looked back. a filmmaker, yes, but more than this, he's a great artist." Terry came in to see Dante. I think he was also coming in to catch Richard Zanuck who was producing Sweeney Todd - to see if he could try and get some finance from that direction for this new film with the wagon. So Terry was chatting to Dante, and I met Terry again. Funnily enough we had built a caravan for Sweeney Todd. The Italian hairdresser, Pirelli, has this caravan in a big open marketplace; he had this competition with Todd. Terry was looking at it, looking at wheels and bits and pieces like that. He was mumbling about having to build this big wagon to go around the centre of London, and I thought little more of it. Sweeney Todd carried on, it finished and we all went our separate ways, and then I had this phone call out of the blue from Terry. At that stage Terry didn't mention what my role might be. He uses this phrase like he does with everybody: Can you help? Do you think you can help, we are putting this thing together, can you help? I said, "What do you want... do you want some money? I could come in and work." It was so weird because it was like fifteen years had never happened. I was driving up to Highgate again, going up to see the boss in the famous loft. I had a very nice afternoon with him, we chatted about it. I'd already seen the script so I had done some sketches and a little bit of research. I went in there and whacked what I'd done on the table. Terry said "Great... great... I see you are thinking about it... but you should have a look at what I've got." And of course Terry had already put together this wonderful leather bound book with key frame images for all the major scenes. He'd got it, he knew exactly what the film needed to look like. He just hadn't filled in all the gaps yet. It led from there really. What already existed when you started? Mainly the book. 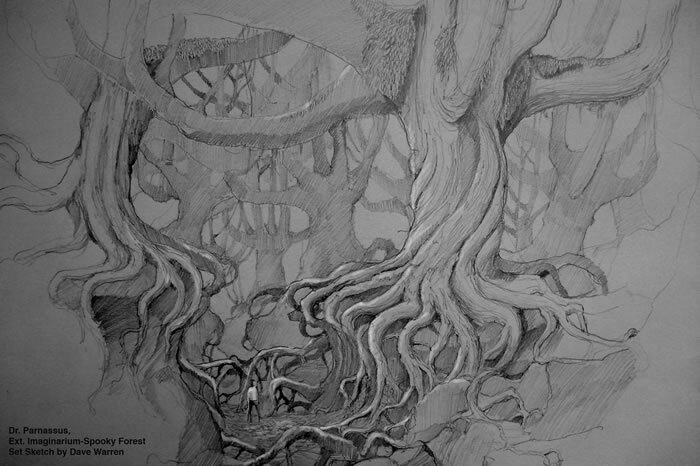 There was also a mass of visual reference Terry had found, and his extensive storyboards. 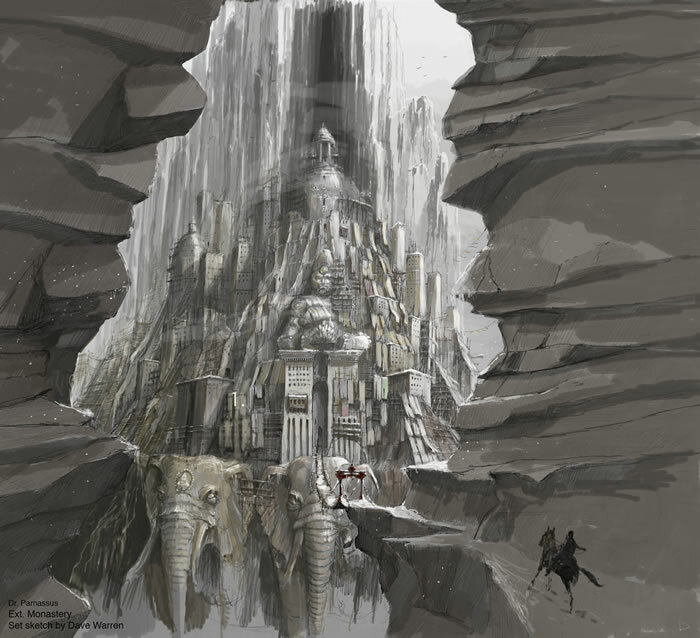 That book was put together by Terry and Imery Watson who was a concept artist and matte painter working at Peerless. I think between them they put these images together. Quite a bit of what's in it is actually Terry - it's his Photoshops, it's his work. The other stuff is by Imery. You can see the bones of it in there. When I read the script, I thought, what the bloody hell is this going to be? Basalt cliffs and a thing comes over, a balloon with twelve faces on it, a whirligig and God knows what else! I was reaching for things in my mind, but you really need to get the image from Terry, because he hasn't thought of it as words on paper, he's thought of it as a picture in his head. He knows what this is going to look like... in seven out of ten cases maybe. Though he'd probably say nine and a half out of ten! What were your responsibilities during preproduction? When I started on the film, I think Nicola had already come over to the UK and had meetings with Terry. Terry had already seen a fair wedge of locations. Again he knew where he wanted to shoot in London. But the finance was still very open. It was strange, because it was like watching open heart surgery. Every week, the old defibrillator would come in, and the thing would bounce back into life again. I remember him yelling down the phone, Amy and Bill were over in the Far East, trying to finish off a film down there. Sammy was just homing into view as a possible financier get it launching again. So it was quite a stuttering start. To begin with we were all in an anteroom at Peerless, Terry sitting on his big rubber ball. I had to go and buy a drawing board (for cash!) and hauled it back with a runner from an art shop in Covent Garden. Rob How, the Line Producer was there, and about this time Claude Paré started, the first production designer - part of the financial politic required a Canadian, which made some sense as the greater part of the shoot was in Vancouver. He was a sweet guy, and there is still a little bit of Claude in the film. I just started working through the Imaginarium sequences from the beginning, grabbing bits of reference from Terry and just extrapolating, broadening them, looking at them from other angles, what's round the corner, what's behind there? I've done that picture but what do we see when we look in the other direction, or can we just make it better? Although that beautiful book was out there, nothing is finished until Terry says it is. It was a continuously moving wagon, we'd always want to try adding something else. And then on rare occasions, when we considered pushing a good idea a little bit further, Terry would say "Why are we still doing that, it's done. That's it, you can stop now." We also started looking at the other essential practical element, the wagon and, with bringing in a draftsman, worked up the first practical model of it. After a few weeks there was one of those financial hiccups and we downed tools - Claude had to leave for a bigger movie near home - and I considered going too - I can remember Terry catching me on the phone on a hilltop and making it very clear I was going nowhere. How do you understand what Terry is after? That's the $64,000 question! He's very good on references, so you can get in that way, and of course he draws - the essential shorthand of design. He wouldn't admit this, but you can get inside his mindset. We've all been watching Python and his movies for years - so you know you should go for extreme references. Take Nick's hat bar - to start with, that wasn't depicted as a hat. In his pre-vis images it was just a little bar, somewhere in Tucson on the side of the road , with cacti around it, and an old neon sign. There was a moment when we looked at each other and we said, it has to be a hat. At that point I wasn't thinking of the Brown Derby restaurant in LA which Terry immediately was, it was already in his mind. I was just thinking that Tom Waits always wears a derby, always wears a bowler hat. It's got to be a hat... hasn't it? Of course there was negotiation about the colour, the state of it, how it blows up and are the windows eyes? But to a certain extent you can get on his wavelength, and you can think., Terry would want to push this. It wasn't just me, there were other people firing ideas. I don't recall whether it was either Terry or the matte artist, when the gondola is on the river, going past Mr Nick on the white staircase, and when you cut to the other angle you see it is all going off into a polluted landscape. It becomes slightly Brazil-esque, with big ducts, chimneys and power stations. Did that come from Terry or someone thinking that that's what Terry would do, I can't actually remember - but it certainly fits the Gilliam mindset. 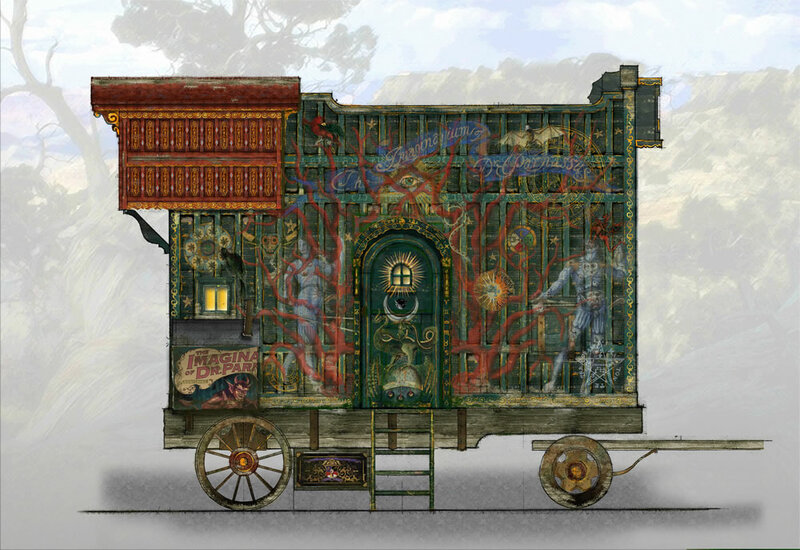 Terry had put an awful lot of energy, specifically mental energy, into coming up with this very particular wagon with its theatre built into one side of it. So an awful amount of time had to be put in to get the thing working right due to the size of it, do its proportions feel right, does it work visually? Stylistically the wagon is very much him. I remember when I first got the script, I went away and scribbled a wagon looking at references: pantechnicons from the Victorian circus and fairgrounds, things like that. I came in and had the conversation with Terry and he said: these are all great, but this is what I want. 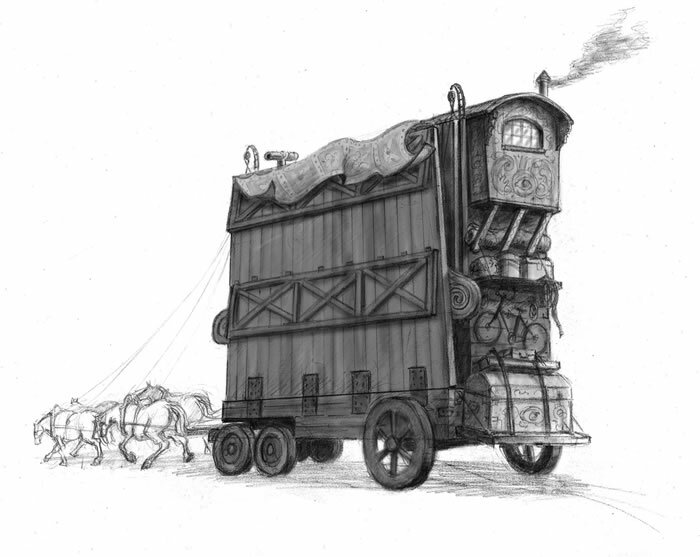 Terry had produced this wonderful pencil sketch before any of us got anywhere near the project - and that's basically the wagon you see in the film. To me, it resembles a tall Egyptian pylon that you'd see at Karnak. 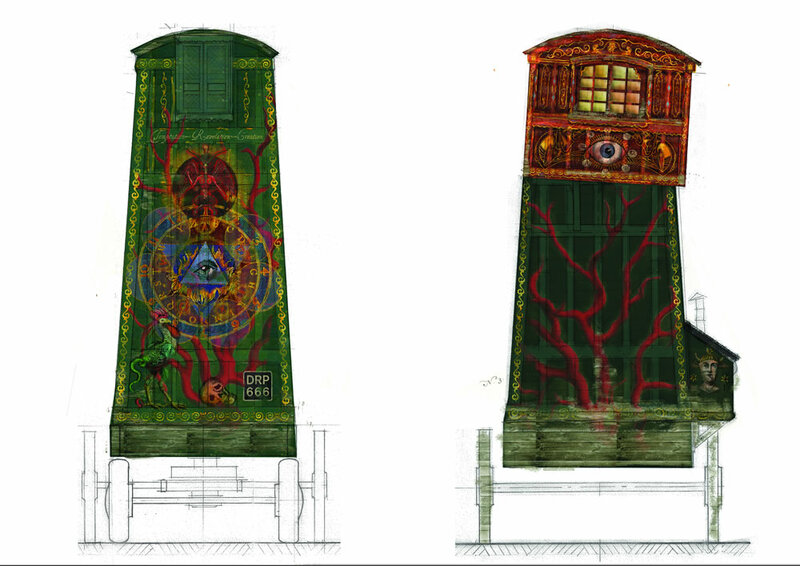 Other people say it reminds them of a ship, or a medieval siege tower, but it's certainly nothing you have ever seen before in London. Apart from something you might get from the mind of Terry. Those were by Carol Kupisz [reproduced below], the graphic designer on the film, who was responsible for graphics throughout the UK shoot, signage and things like that. One of the things she got into was the wagon. Terry was always focussed on the thing being very decorative. He gave us all of these arcane images (Robert Fludd etc.) that he had put together - it came into my hands and I passed it on to Carol, who knew exactly what to do. So I can't take any credit for putting the big red tree on the side of it or anything like that, that was all her, and Terry absolutely adored it. I think he's got a set of those prints hung on his wall at home. He absolutely loved the graphic presentation of the wagon. It's a shame we had to age it all down. There was an awful lot of work that went in that caused a lot of pain and consternation on the London end of the shoot. But I still think he was still very pleased at the way it looked, and the way it lit. When you've got Nicola's stage lamps inside it, it's got this warm translucency in those old backdrops, they are aged and tattered. We had the art department, at Terry's behest, sticking old labels and chalk marks on the back of it. That is all there to be seen. It maybe doesn't hit you in the eye, but it gives the wagon a general layering of dust and age. Which is something common to all of Terry's films. Everything has to be so layered and so textured. There's never a case of not putting enough in. He just loves it, not a square inch wasn't covered with something. What was the division of responsibility between you and the Anastasia Masaro, the Production Designer? Well the obvious division was the continental one - I took care of the London chunk and Anastasia would take care of the locations and builds in Vancouver. There were big overlaps of course, but we worked it out as best we could. 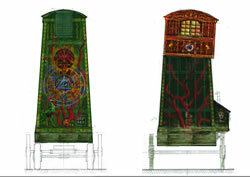 For instance she spent a long time with Caroline, the set decorator, having an input into the wagon interior, particularly Parnassus' cabin, which was common to both London and Canada - and did the early pass over the proscenium graphics. Conversely I was up to my neck in concepts for the Imaginarium worlds still - which helped define the Canada bluescreen builds. We prepped together in London, and then she left just before the UK shoot to get her construction and art directors going in Canada. I did the UK shoot, with my art directors in London. Then the responsibility passed over to Canada, with which I think they did a great job - the monastery interior especially looked great. I understand it was a really hard shoot - just what happened with Heath, even though it was a very compressed shoot all over anyway. There was an awful lot to do with a limited budget, very ambitious. We were all doing horrendous hours in London, due to the relentless night shooting and the rotation of the wagon rigging crew, and then they were doing terrible hours in Canada as well. Eventually the project came back to the UK, and I did the model unit over at Bray, for another four weeks. That's how we split it. 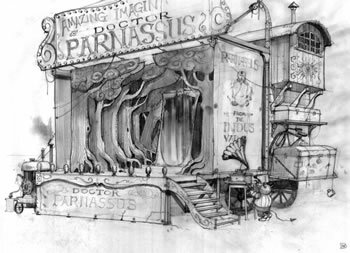 Unfortunately, I was the one who did most of the drawing up front - we just couldn't have a conceptual artist on the books- it would be me, sometimes a matte artist helping out at Peerless, or Nicola and Terry's friend Daniele Auber - he offered to help from home. He is special, he was a friend of Heath's, and really helped out on three key sequences for us - and God can he draw. The wagon on Blackfriars Bridge was Terry and the wagon at Battersea was me. Battersea covered several scripted set locations so we were attempting to site the wagon in different parts of it. Terry had always wanted to use the power station, he loved its dereliction, so he had photographed it early on. I was doing the Photoshops from those photographs. Was it your responsibility to dress the London sets? Very much so - and this is my great axe to grind! The paradigm, the scheme that Terry had come up with was that we would build this marvellous wagon, we'll sink all our money into it, it will be the great Swiss Army knife of film sets, and then we'll just haul it around London with four horses and wherever we shoot we open it up, light it, and bang - bang - bang - off we go. It's a fantastic premise, it sounds so simple. Yet we proceeded to do something at every location we went to. Take the fairground by Tower Bridge - obviously there's no fairground there, we had to put one in it. 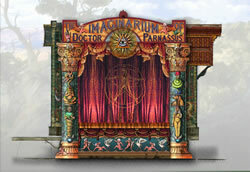 I don't know if you have ever hired a fairground, but you can only imagine the conversations we were having! We had a fantastic guy, John Drake, who did a really great job for us. We had a really good, festive look going- and while we were shooting, there was a German fair behind us, so some of the stalls and one of the Ferris wheels in view are not actually ours at all, but it looks great. So, from my earliest days on it, I knew it would be a very complex and interesting shoot! Lots of energy, lots of opinions flying around. Films of that sort of budget generally are. They are never straightforward because there are lots of different people in there that have put the financing together and the thing is somewhat rickety. And then you multiply that by the factor of Terry. Yes, it was a film that was financed as we went along. Heath and the film were bound together. The fact that Heath Ledger was attached made the project real. In the early stages, the fact that Heath was there, it brought the right faces to the project. Without Heath I don't think that Sammy would have come in and thrown money at us to get us going. It was hand to mouth in those early stages. There was a lot of: will we get paid at the end of the week or the month? Whether or not people love Terry and want to work with him for nothing because they think it is a very worthy project, by then I was employing people further down the line who have kids and mortgages. At some stage that artistic worship stops, because these people have other priorities. I really wanted to be there, as did Denis and Caroline. But as you went down the line, there were people asking: is the cheque in the post, or am I finishing Friday? I had to keep reminding myself that the reason films have budgets is to spend them... and most of that goes on labour, of one kind or another. I do remember these days strongly, the accounting resembled Spaghetti Junction. So yes definitely, the project did fulfil my expectations. I had known Terry on and off before then, so I knew his character. And I thought what he does in ten minutes, what was that going to be like for six months? And can I do it? Well, of course I could. He's just an old man and if he wants to whack me, I can run faster than him!